Peter Tyson of Savills handled the sale on behalf of a Sydney-based private investor who has held the property since acquiring it in 2009. The Coles-anchored neighbourhood centre is believed to have traded on a firm yield of close to 7 per cent. Mr Tyson said this is reflective of both the strength of the current market demand and the strong location in inner Brisbane. "Assets of this nature are a rare commodity this close to the CBD and tend to be very tightly held. “The quick sale and yield result are further evidence of the weight of capital seeking investment in the retail sector, with yield compression ongoing through 2014. "Mr Tyson says that yields have steadily compressed from late 2013 through 2014 with a range of neighbourhood centres transacting in recent months at yields generally ranging between 7.25 per cent-7.75 per cent, including the Coomera City Centre, Marsden Park, North West Plaza and Northpoint deals. 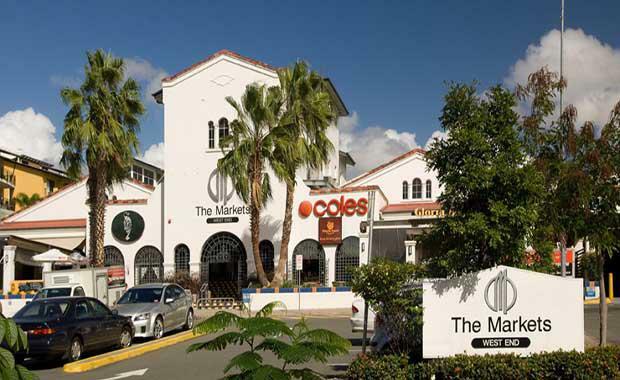 The Markets shopping centre situated in Boundary Street West End features a 3,000 square metre Coles Supermarket with 23 specialty shops totalling 5,253 square metre GLAR. The centre features 276 parking bays including some 232 over two basement levels and a further 44 at grade level. The iconic property incorporates part of the historic Tristram’s soft drink factory, originally built in circa 1928. In 2001, local developers Heritage Pacific acquired the property and substantially redeveloped it, retaining elements of the striking Mission Revival architecture, which still makes the building a well known local landmark. Mr Tyson also transacted the asset in 2009 for Heritage Pacific. The centre services the surrounding West End and South Brisbane catchment, with South Brisbane rapidly undergoing a wave of high-density residential development. “The urban renewal and transformation of South Brisbane accelerated pace last year when several apartment projects sold quickly in response to improved residential demand. Given the level of amenity of this precinct and proximity to the Brisbane CBD, the South Brisbane precinct is expected to see enormous population growth which augurs well for the centre” Mr Tyson said. Mr Tyson said the centre attracted immediate interest and offers from a handful of buyer groups and traded very quickly.